Ecomax are an authorised UK dealer of Commercial Warewashing Cleaning Chemicals. If you're looking for the best service, information, and advice on Commercial Warewashing Cleaning Chemicals get in touch with us today. Ecomax's Premium Glasswasher Chemical Starter pack is all you need to get started with your new glasswasher. It is designed to stop spotting and streaking on your glassware and will give them a sparkling finish. This starter pack contains 2 x 5 litre bottles of our high quality Glasswasher Rinse Aid and 2 x 5 litre bottles of our premium Glasswasher Detergent. Ecomax's glasswasher detergent has been developed for use in glasswashing machines, this powerful detergent is excellent at removing remnants and stains from glasses, leaving a sparkling finish. To achieve the best results use in conjunction with our premium rinse aid. This pack contains 4 x 5 litre bottles. Ecomax's glasswasher rinse aid has been developed for use in glasswashing machines. This active rinse aid is formulated dry faster with streak free results. This pack contains 4 x 5 litre bottles. Ecomax's powerful dishwasher detergent is an excellent cleaning product for medium to hard water areas but is also suitable for any soft water areas. To achieve the best results use in conjunction with our premium rinse aid. This pack contains 4 x 5 litre bottles. Ecomax active dishwasher rinse aid delivers spotless drying and a brilliant shine. The high performance concentrate eliminates spotting and streaking to leave a brilliant sparkling finish without the need to towel dry. This pack contains 4 x 5 litre bottles. Ecomax's active limescale mineral descaler is a concentrated, unperfumed acid cleaner for kitchen equipment and utensils. The fast acting, effective solution is suitable for commercial equipment such as dishwashers. Each descale requires approximately 2.5 litres of descaler per machine, dependent on the level of scale build up. This pack contains 4 x 5 litre bottles. 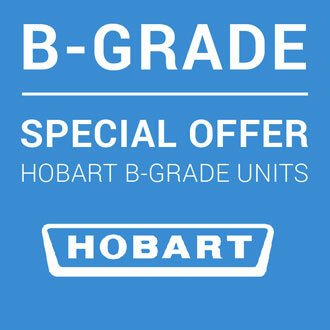 Your Hobart machine is set to 1500 wash cycles before it requires an intensive hygiene cycle, to clean through the whole unit. Your machine will indicate this with a HYG alert, then add the INTENSIV hygiene tablet into the warewasher to eliminate any tough starches left on the internal components.